Confession: I’d never heard of a quaich before until I had a couple with Scottish roots ask me if we could add it to their wedding ceremony. Are you wondering how to add a quaich to the wedding ceremony for your couple? Technically, a quaich (pronounced “quake”, but with more saliva) is a style of cup or bowl that traditionally originates in Scotland. So really, we would properly call this a quaich wedding ritual or something like that. But let’s go with the shorthand: this ritual takes on the name of the object that it’s centred around – the quaich. Couples are more interested in the spirit of the thing. They want to preserve the elements and its meanings with less concern for the pomp and circumstance. So, is my way the single, proper way to do a quaich? Maybe not. For that, track down your BFF’s Scottish grandma. Here’s how to add a quaich to your wedding ceremony. What we need to do a quaich in the wedding ceremony is 1) a quaich and 2) something to drink out of it. In my wedding contract with the couple, I always ask the couple to provide any accoutrements or furnishings we need in the ceremony. So if they want a quaich, hopefully they can find one at a place like BuyQuaich.com. Or their grandpa’s attic right next to the bagpipes. As for the drink, it can be anything, really, because the symbolism of the quaich is how sharing a cup symbolizes sharing a new life together. Traditionally, the drink is Scotch, and so most couples go for that. And while drinking Scotch neat isn’t always everyone’s cup of tea, that’s precisely what adds a lot to the ritual’s, shall we say, spectator value: watching the couple – and perhaps their wedding party if they’re included – take a swig of straight Scotch for perhaps the first time since that night 3 years ago at 2AM in Amsterdam. But the couple can use water or anything they like. With the quaich and the Scotch acquired, we place them both on the signing table before the ceremony – or on a table assigned just for this purpose. Now… to incorporate the quaich into the wedding ceremony. I like to do the quaich just after the Signing of the Registry. Why? Because I like to put the kiss and the cheer before the Signing rather than after, and it makes for a bit of a party atmosphere during the signing rather than a serious or uptight library vibe. So coming out of the Signing – when we all come back to the centre – this is the perfect time to explain that now the couple are married, and that it’s customary for the couple to start their married life by immediately sharing a drink. So we do the quaich and then we close with a couple of logistical remarks and get right to the Presentation of the couple for the first time. Putting the quaich between the Signing and the Presentation preserves that fun vibe for the quaich. Now that we’ve talked about what we need and when to do it, let’s break down the way to structure a great quaich for the wedding ceremony. The quaich is essentially a ritual where the couple drink out of the same cup/bowl while each holding one of its two handles the whole time. It symbolizes their togetherness and lifelong unity. As with all these things, we have to think about how it will “play” during the ceremony as everyone in the seats looks on. If the ceremony vibe has been upbeat and playful, then this could really get dour and kill that mood a bit. And nothing does that better than dead air. Total silence. So what we as officiants want to do is make sure that we’re saying important, relevant, and interesting things about what’s happening while the couple and/or their wedding party are doing their thing. Here’s how I structure the quaich. First, the couple and the officiant resume our places at centre stage. Meanwhile, the people who the couple have asked to prepare the drink (often the Best Man and Maid of Honour), come to the table where the cup and bottle are, and they get to work pouring it. Typically, one person will pour the Scotch (or whatever the couple have chosen) and one person will bring it to the couple in just a moment. Second, while the two drink-preppers are doing their thing, the officiant is addressing the guests. Third, after the officiant has explained it, the one assigned to bring the drink hands it to one of the newlyweds. He or she takes it by one handle, and the other newlywed will take it by the other handle. The one who received the cup first will drink, and then the other will drink. It’s slightly awkward, but… meaningful. Fourth (and this is optional but really fun! ), in the quaichs I’ve done, the couples have included their wedding party. So after the couple have each taken their sip, one of them will hand it to a member of their wedding party (typically the Maid of Honour – ladies first! ), and each member of the wedding party will all pass the cup to each other one at a time, each taking a sip. While this is happening, we officiants are explaining the significance of friends and loved ones to a married relationship, and how everyone up here will play a key role in strengthening the couple’s ongoing marriage. Prepare to be upstaged, though – if what they’re drinking is the traditional Scotch (and straight! ), then some of their reactions are bound to be stealing the show while we talk. So just laugh along. With the last of the sips taken, the group in a sort of mob huddle at the front, and everyone feeling pretty loose, it’s time to wrap up this ceremony fast: make those closing remarks, present the couple, and get on to the party! 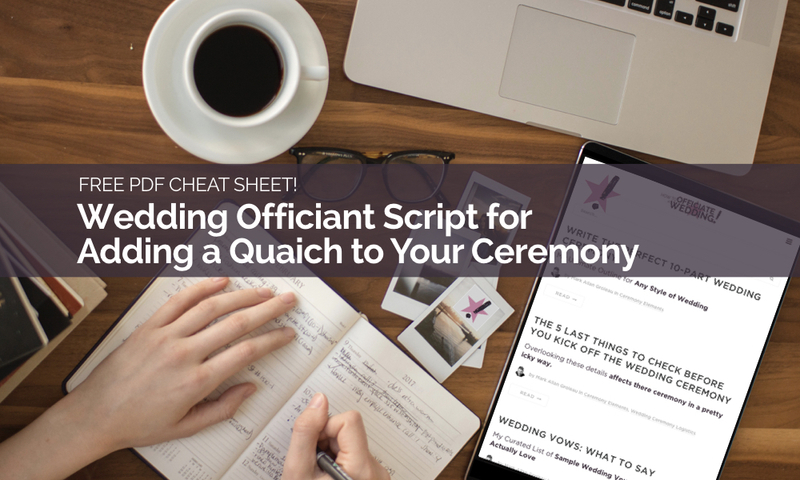 Get my full script for adding a quaich! How about you – have you ever done a quaich? What was it like?